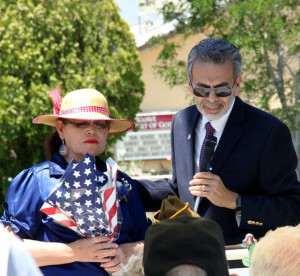 Gold Star Mom Hilaria Hannon, receives a bouquet of flowers from family friend Tony Barragan during a Memorial Day Ceremony at the Mojave Cemetery. Hannon’s son, Marine Pfc. Fernando Hannon, 19, was killed in an explosion in Al Anbar Province in Iraq in 2004 while serving as a rifleman with the 1st Marine Division. Fernando was the fifth generation of his family to serve in the U.S. military. 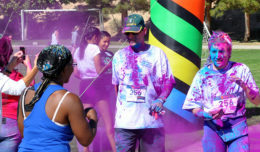 Mojave is a small town but when it comes to honoring veterans, their heart is huge. Guests gathered in the Mojave cemetery were more than 450 veterans are interned. “It is daunting to consider the tremendous sacrifices our veterans and their families have made — how can we possibly say thank you?” remarked Nash. She encouraged guests to contact local representatives and voice their support for legislation that increases veteran’s access to housing, healthcare, education and employment. Also, supporting caregivers, giving rides to medical appointments, volunteering at veteran’s events, and companionship, are all practical ways of honoring veterans, explained Nash. 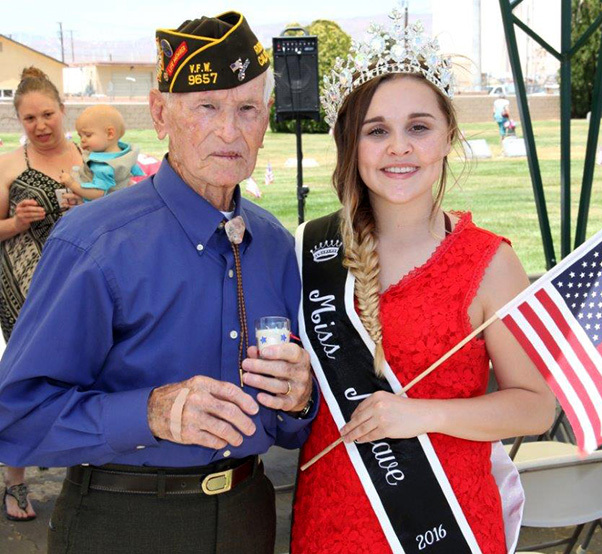 Mojave Queen, Courtney Woodruff, 19, chats with World War II Veteran Noel Dees, 97 during a Memorial ceremony in Mojave. Community queens placed more than 450 flags the day before the event. With the help of Leon Ryder and Ken Kendall, Gold Star Mom Hilaria Hannon laid a wreath at the “Battlefield Cross” to honor all those who lost their lives serving. Mrs. Hannon lost her son, Marine Pfc. Fernando Hannon, 19, in 2004 during an explosion in Al Anbar Province in Iraq while serving as a rifleman with the 1st Marine Division. Fernando was the fifth generation of his family to serve in the U.S. military. 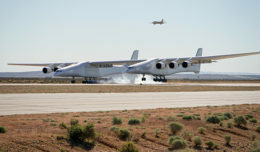 Mojave Air and Space Port Airport Operation Director John Himes was the keynote speaker for the event. 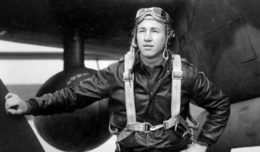 He served three years enlisted in the Army Reserves and nine in the U.S. Navy as a helicopter aviation warfare systems operator. Other duties included 16 years as an officer in the Air Force. “Freedom takes willingness to serve, to sacrifice,” said Himes. Pastor Charles Lowery offered the invocation, and Ken and Sally Kendall explained the POW/MIA Remembrance Table. The event concluded with cookies and a flyover by retired Marine Robert Stambovsky in a T-34.